“The Wizard of Oz” hit the silver screen and Batman debuted in DC Comics the same year as the World’s Fair in New York City opened – 1939. Helping guide you back to the final year of the 1930s, before the United Stated entered World War II is the Ford Deluxe Roadster Sedan, proudly presented by MotoeXotica Classic Cars. This Ford is awesome! It has a correct exterior appearance but under the hood you will find the Flathead V8 has been juiced up with some excellent period correct modifications such as triple genuine Stromberg 97 carburetors, Edelbrock heads and intake breathing out of dual exhaust. We acquired this car from local loving owner who had this Ford for the past 13 years. Finished in handsome Tropicana Green, the car’s paint and chrome trip are in overall very good order. The car’s glass panels are tinted and intact while the car’s lights are in good original order. This Ford’s bodywork is solid and straight, its white folding top is in good order, the engine bay is tidy and shiny, its cargo area is in very clean condition and includes a full-sized spare tire. 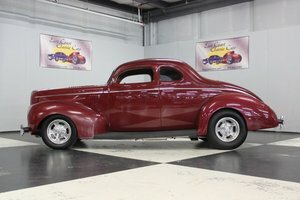 This car rides on steel wheels with factory wheel covers that are in great presentable condition and those wheels are surrounded by Firestone Deluxe Champion wide whitewall tires that were gum-dipped, size 6.00-16 at all four corners. Under the hood is Ford’s famous 221 CID Flathead V-8 engine but it came from a 1940s Ford, breathing via triple genuine Stromberg 97 carburetors, Edelbrock heads and intake breathing out of dual exhaust and the motor is buttoned to a three-speed sliding gear manual transmission with overdrive. The car has been upgraded to a much more reliable 12V system. The biggest mechanical update was that Ford adopted Lockheed’s Hydraulic Brakes on all of its models for 1939. Inside, the brown leather front and rear bench seats are in excellent shape and the tan carpeting looks great. The three-spoke “banjo” type steering wheel is in fantastic condition while the brown instrument panel and matching inner door liners are in very good order. An aftermarket engine temperature gauges is mounted below the dash and aftermarket seat belts have been added to the front and rear seats. The original speedometer and the odometer are inoperable. Completing the interior is a Realistic AM/FM stereo with cassette player. Ford Motor Company introduced its De Luxe Ford line in 1938 as an upscale alternative to bridge the gap between its base model (usually called Standard) and luxury Lincoln offerings. The “Deluxe” name was used intermittently before and after this to specify an upscale trim but the De Luxe Ford line was differentiated as a separate “marque within a marque” with separate styling and pricing through 1940. During 1939, Ford had five lines of cars: Ford, De Luxe Ford, Mercury, Lincoln-Zephyr and Lincoln. After the war, this was simplified to Ford, Mercury, and Lincoln. As Mercury sales progressed, the De Luxe approach was cancelled. The De Luxe Fords of 1938 featured a more sloping hood and ornamental heart-shaped grille. This look was passed on to the standard line for 1939, as the De Luxe Fords gained sharp v-shaped grilles with vertical bars. Ford\'s look was again modernized for 1939 — the Deluxe used a low pointed grille with heavier vertical slats, while the standard Ford had a higher grille with horizontal dividers. The headlights were moved farther apart, now sitting almost in front of the wheels. The side grilles and louvers were removed in favor of chrome strips on Deluxe models. The “alligator” hood opened deep from the top of the grille back, eliminating the side panels found on previous models. The phaeton, club coupe, and convertible club coupe models were discontinued. The engine was also revised for 1939 with downdraft carburetors widening the torque band but leaving power unchanged at 85 hp. Hydraulic brakes were a major advancement across the Ford line. Competition to this Ford in 1939 included Buick’s Special Four-door Convertible, Cadillac’s Series 61 and 75 Four-door Convertibles, Lincoln-Zephyr’s Four-door Convertible Sedan and Mercury’s Eight Four-door Convertible. This car is currently located at our facility in St. Louis, Missouri. Current mileage on the odometer shows 90,000 miles. It is sold as is, where is, on a clean and clear, mileage exempt title. GET OUT AND DRIVE!! !